Water thoroughly during dry spells. Snap off the scapes of your garlic plants. Tender young scapes make a great addition to stir-fries, and can be used as a substitute for chopped garlic bulbs in sautés. They can be used alone or with other herbs in pesto. Scapes can also be used as cut flowers; a single garlic scape in a narrow vase presents a changing ornament, and a large bouquet of them can be breathtaking. Watch your garlic for signs that it is ready to harvest toward the end of July. Check Bulletin #2063, Growing Hardneck Garlic in Your Maine Garden for more details. Tomatoes produce strong growth in midsummer’s warmth. Don’t wait too long to sideshoot staked or trellised your tomato vines (indeterminate tomatoes). When zucchini plants start to produce fruit, check them at least every two days and harvest the fruits when they’re young and tender. Weed, thin, and water carrots and onions for best results. Carrots that “wrap around each other” are an indication of overcrowding. If you’ve had that problem in past seasons, don’t let the young roots enlarge too much before thinning them! As your pea harvest ends at the end of the month, compost the plants and plant a second crop in its place. 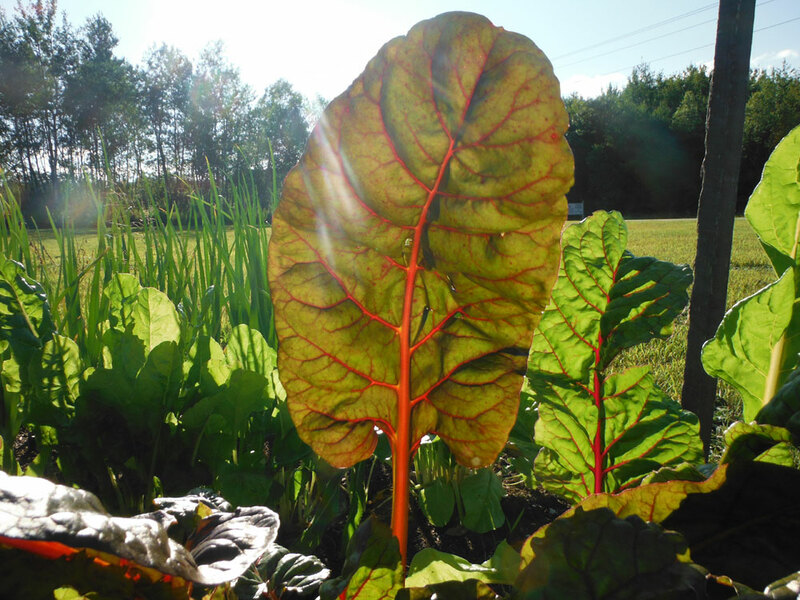 Spinach and lettuce have plenty of time to mature before fall’s frost. There’s still time to plant a row of beans in place of the peas. If you don’t want to plant another crop, replace the peas with a cover crop like buckwheat or oats. Remove young weeds. Summer weeds can quickly overwhelm a vegetable garden. Galinsoga, lambsquarters, and redroot pigweed seem to mature almost overnight. Learn to recognize them as very young plants, when you can scuffle-hoe them easily and quickly. If left to mature, each of these weeds can produce many hundreds of seeds per plant, thereby becoming an even greater problem next year. Deadhead perennials that have already flowered. Although this will not produce new flowers in most species, it will keep the garden looking good, and will prevent the plants from using energy to produce seed heads. Deadhead annual flowers to promote production of new flowers. 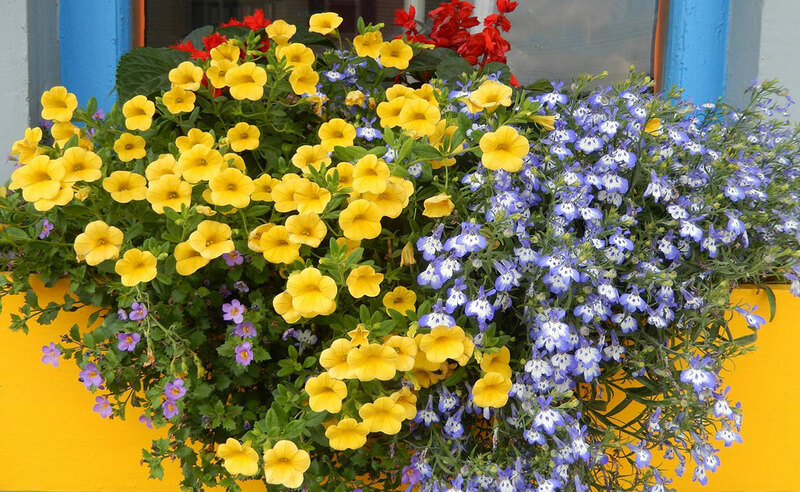 This is especially important for snapdragons, salvias, alyssum, dahlias, zinnias, and pansies, which tend to stop flowering if not deadheaded promptly. 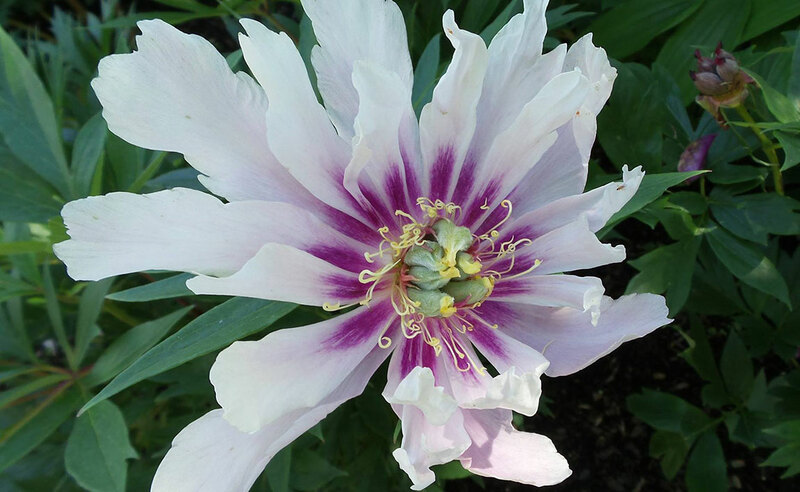 Divide and replant bearded irises and peonies, if needed. Cut back bulb foliage after it has completed its job. 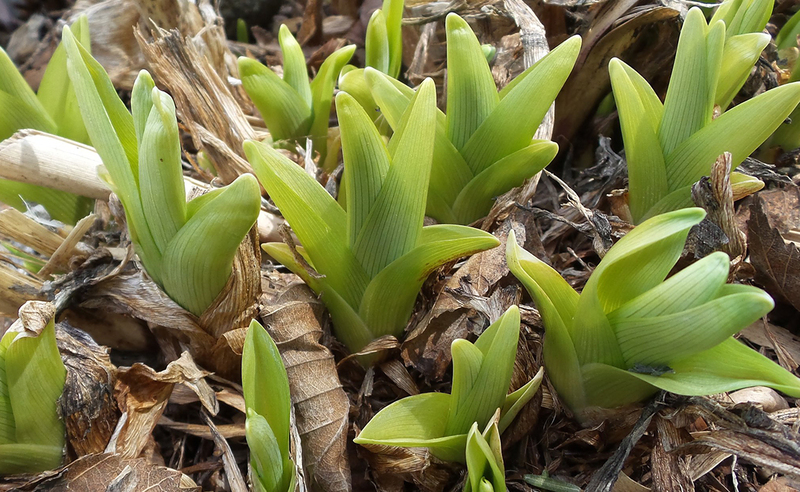 Daffodils, tulips, and other spring bulbs die back to the ground naturally, but you can remove this foliage when it starts to turn yellow, keeping your garden look well kept. Daffodil bulbs that produced few flowers this spring can be dug now, and replanted. Remove and discard the small bulb splits, and plant only the largest bulbs back into the garden. 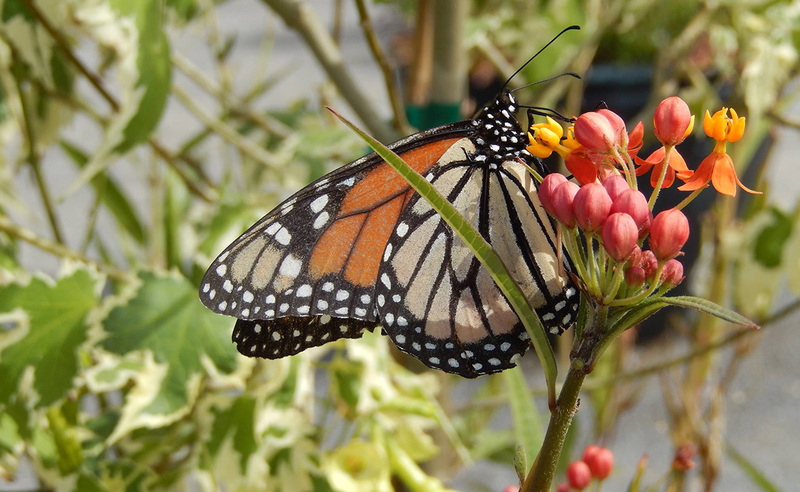 Rather than discarding the smaller ones, you can move them to a cut flower garden where they will mature and produce flowers in two or three years. 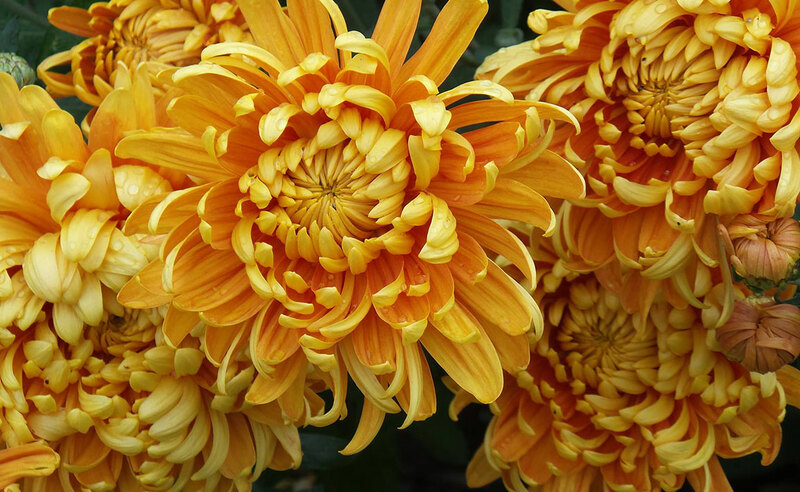 Order new bulbs for fall planting. 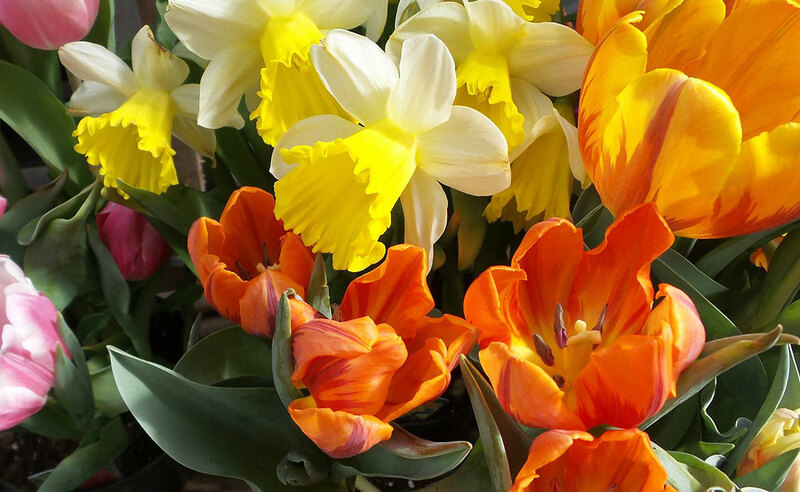 There are some terrific newer daffodils with solid orange or pink coloration. Some are only carried by mail-order or internet companies, and orders should be placed in midsummer. Relax and enjoy! Fertilizing and pruning are done for the season. The lawn is growing a bit slower in the heat of summer and needs less frequent mowing. It’s time to grab a book and a glass of lemonade, lie in the hammock, and enjoy the summer. July is an important month in the growing of garlic because a number of things are going on. Scapes, the above-ground reproductive structure of hardneck garlic, should be well along in its growth stage. I always leave a few scapes on my plants because it’s fun to watch them emerge from the center of the plant, curl, then uncurl as the plant matures then finally bursting from its covering (spathe) to reveal flower parts and bulbils. But in general, scapes should be removed for better bulb production. Research done by the University of Maine Cooperative Extension showed that bulbs from plants whose scapes were not removed were up to 47% smaller. Harvest scapes after they have emerged from the center of the plant by snapping them off below the whitish part that will become the umbel, which bears the flowers and bulbils. Young, tender scapes are great in stirfrys and to make pesto, but become woody in later stages of growth. Most bulb growth is now just starting to take place with garlic. For that reason, it is important to keep your garlic planting weeded. Garlic, like other garden plants, will realize its potential with adequate water. One inch of irrigation per week is recommended in the absence of a like amount of rainfall. The timing of garlic harvest is important. If harvested too early, bulbs will not have gained their maximum size and will not store well. Late harvests will leave garlic bulbs denuded of wrappers with cloves that appear soiled, though are entirely edible. 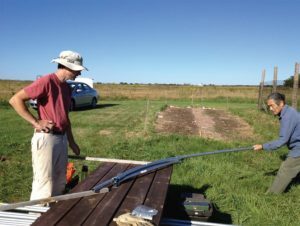 Garlic harvest is gauged by physiological plant cues. There are two good markers to tell you when it’s the best time to harvest your garlic. The first is by the number of dead, brown leaves on the bottom of the plant. There should be three dead leaves, counting from the bottom, going up. The lowermost leaf, which corresponds to the outermost wrapper on the bulb, may be practically gone. The second harvest cue is the scape. The scape should be fully extended after coiling and uncoiling. In the Farmington area, these two harvest cues coincide with the end of July to about the first week in August. After harvest, make sure to quickly dry your garlic crop. There are fungi that will degrade your crop if you don’t quickly tend to your crop after harvest. Hang plants in small bunches in a well-ventilated area like a garage. Better yet, make a drying rack out of two-by- fours with chicken wire for the bulbs to rest on. Store your garlic in a cool area with moderate humidity. I store garlic in my basement, which is about 60 degrees and 50% humidity and it usually lasts until May, depending on the variety. Stay tuned to learn about the results of an ongoing UMaine Extension applied research project on garlic: is there any correlation between the size of the clove planted and the size of the bulb harvested? For more information on garlic cultivation in Maine, please see Bulletin #2063, Growing Hardneck Garlic in Your Maine Garden. A community garden dedicated to wellness and healing for those touched by cancer is growing- in more ways than one. The Dempsey Center for Cancer, Hope & Healing was founded in 2008 by actor and Lewiston native Patrick Dempsey and his sisters Mary and Alicia. Their mother, Amanda Dempsey, had been battling ovarian cancer for many years. Recognizing that it’s not only the patient who is impacted by a cancer diagnosis, the Dempsey’s wanted to create a place where families, friends, and caregivers could all be supported. While the center is partnered with Central Maine Medical Center, services are available to people no matter where they are receiving treatment. Patrick’s sister, Mary Dempsey, oversees the center, which offers 100 percent free education, support, and services to anyone impacted by cancer. 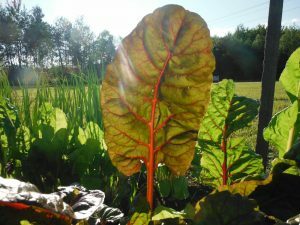 In 2013, Oncology Dietician Amanda Ettinger and Program Manager Mary Doyle contacted UMaine Extension about working on their indoor healing garden, located on the fifth floor of the old Knapp Shoe Factory building in Lewiston. The conversation about that garden quickly turned to another project, one where nutritious foods could be grown for their demonstration kitchen, and families could grow fruits, vegetables, and herbs for their own use. Project partner Cascades Fiber in Auburn donated land, watering equipment, and lots of time, and with the help of Master Gardener Volunteer Dennis Connelly, ground was broken for the Garden of Hope in 2013. In the year since it was first established, the Garden of Hope has already doubled in size. All of the supplies, including lumber, seeds, seedlings, watering cans, hand tools, and buckets have been donated by area businesses. 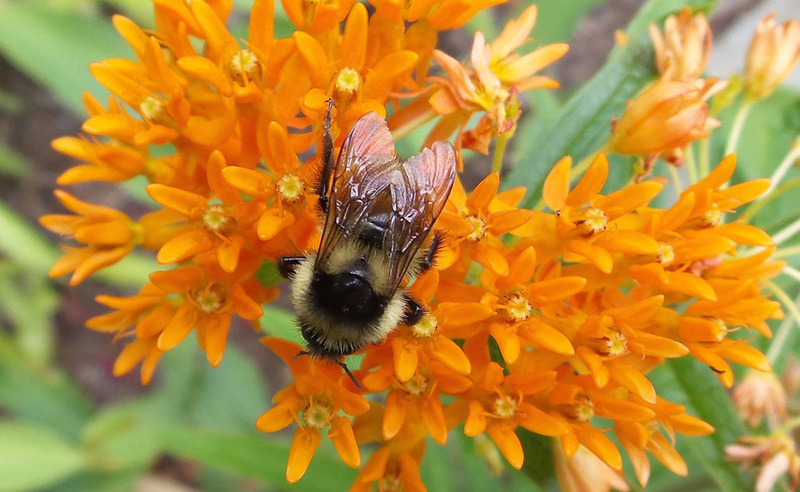 Cancer patients, employees, and family members are encouraged to visit the garden often, and are free to grow whatever they like in their own plots. Patients and their families are growing food for themselves and food to donate back to the Dempsey Center. 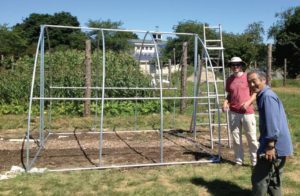 Dennis Connelly spends a lot of time at the garden, building raised bed frames, filling and maintaining the raised beds, and offering tips to the gardeners who tend their own plots there. At a showcase of local Master Gardener Volunteers Projects at the last MGV training for 2014 in Auburn, the passion Dennis has for this project was evident. He spoke eloquently about how much this project means to him, showed some fantastic photos from last year’s harvest, and recruited several new volunteers for 2014. As a Master Gardener Volunteers program coordinator, it is projects like this one that really excite me. The Garden of Hope is a perfect example of how much of an impact volunteers can have in their communities, and in the lives of their friends and neighbors. Physical exercise, fresh air, healthy food, hands-on education, and friendship are exactly the kinds of benefits the Dempsey family had in mind when they created the Center. These also happen to be some of the goals of the Master Gardener Volunteers program. I am so proud that UMaine Extension is affiliated with this effort. If you or someone you know is dealing with a cancer diagnosis, I encourage you to find out about all of the free support available at the Dempsey Center for Cancer, Hope & Healing. If you are a Master Gardener Volunteer interested in working on the Garden of Hope, please contact Mary Doyle at 330.7457. 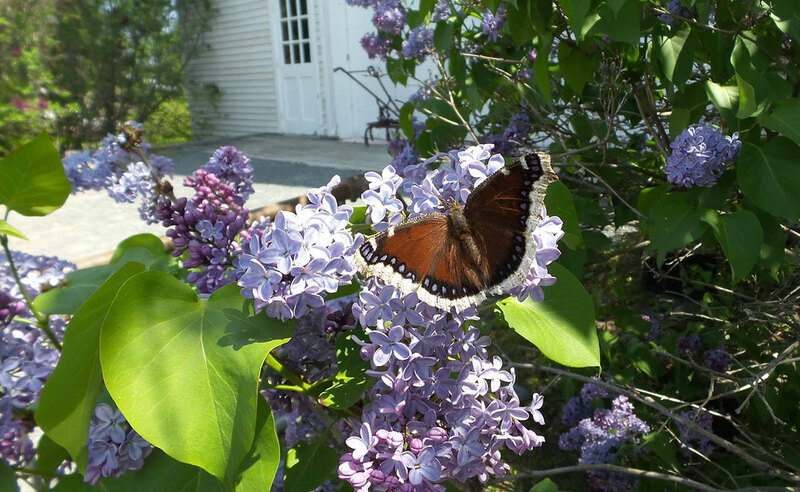 Four-season gardens in Maine have been around for many years now, originally and to this day still, popularized by Maine Farmer/Author Eliot Coleman. Over the years structures have been modified but the basic tenets remain the same: provide an unheated (though some commercial growers use supplemental heat) greenhouse structure, plant hardy greens and root crops in late summer, cover them with row covers for the winter, and harvest the benefits on the back side of the growing season. Many gardeners make these into movable structures so that when they are rotated to a new site after the winter season, the rains will leach any build up of soluble salts out of the soil. 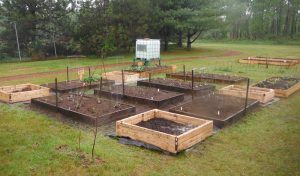 You can also then use the same structure in a second location for an early harvest of your spring garden of peas, lettuces, crucifers, root crops, etc., and then move it again in late spring to yet a 3rd location to get a jump on your tender crops such as tomatoes, melons, basil, etc. Does this sound too good to be true? 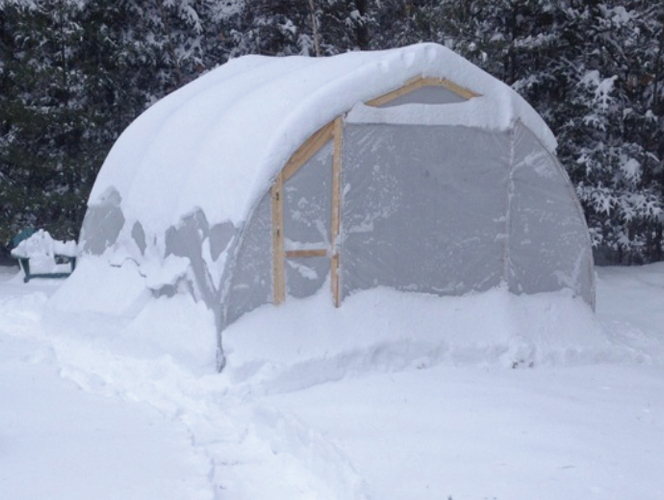 Many Mainers are now using simple structures to garden year-round! At MOFGA’s Common Ground Fairgrounds in Unity Maine, there are several small home garden structures that have been built for demonstration. Most of them are made using hoop benders, a simple device sold by companies such as Johnny’s Select Seeds, and Hoopbenders.com. With these benders, and following the instructions that come with the bender, home gardeners have been bending their own hoops out of electrical conduit pipes. 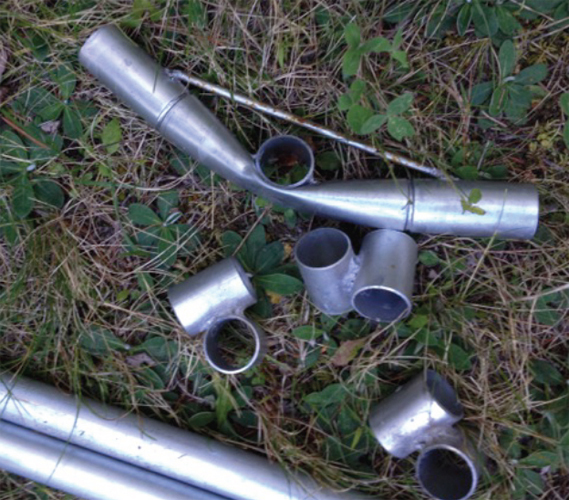 The pipes come in 10-foot lengths from local hardware or electrical supply stores and are relatively inexpensive. Frame complete ready for plastic. 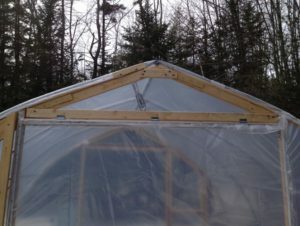 The structures do need to be covered with a quality greenhouse grade plastic, which usually is rated to last a minimum of 4 years. The easiest and least expensive way to start if you are not well skilled or don’t have a lot of tools is to purchase a connector kit from the same companies which sell the benders. Last year the York County Master Gardeners built a sample structure at the All Seasons Garden at Laudholm Farm in Wells in order to teach the public about building a small inexpensive structure that would stand up to the Maine Winter. One of the lessons we learned is that in an open field such as Laudholm Farm, it is very important to secure the structure well to the ground and make sure the plastic is well secured to the frame to prevent blowing and ripping of the plastic. 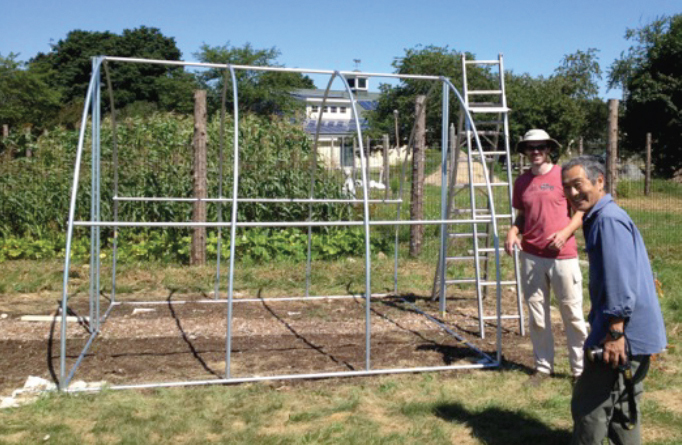 Biddeford Farmer, Brent Peters, and York County Master Gardener Volunteer, Allan Amioka, use hoop bender for a greenhouse frame. After helping with this project, I decided to give it a go on my own and built my own home structure. As you can see, it is important to make sure the frame will shed snow well. For this reason in both locations, we used a Gothic arch design to give the roof-line a little steeper slope to help shed snow. I also added a Univent (see photo below) to the peak of the roof to aide in ventilation in the warmer spring and summer seasons. The center section can also be totally removed in summer to ventilate more fully. For planting schedules there are several books and articles on Gardening for a Four Season Harvest. I would recommend the book, a Four Season Harvest by Elliott Coleman. For more information contact Frank.Wertheim@maine.edu or call the York County office of UMaine Extension at 207.324.2814. 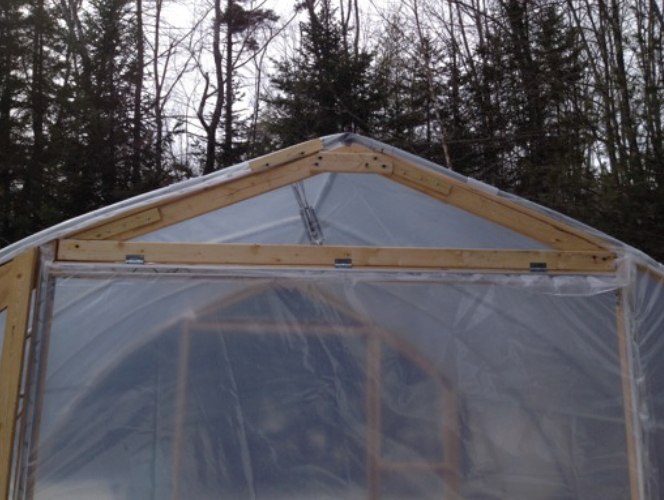 Greenhouse showing wax expanding “Univent” and removable center for increased spring and summer ventilation. 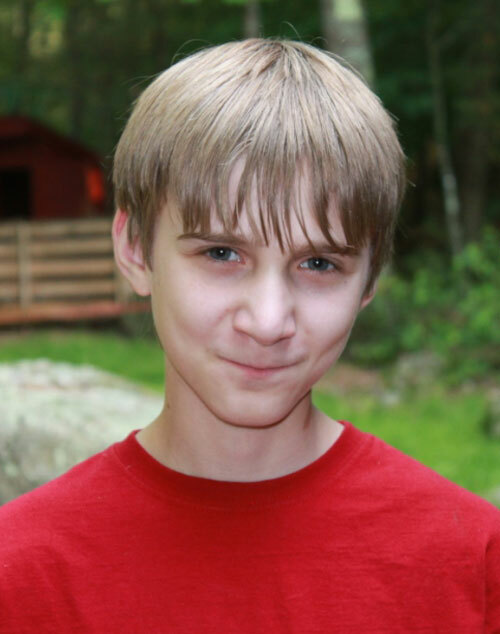 Caleb, a 13-year-old 4-H member from Gray, is leading his community to reduce food waste. As part of the requirements for a special 4-H outreach known as the Sustainable Living Project, he successfully conducted a service learning project at Gray-New Gloucester Middle School. Service learning is not so much community service as it is a way to learn standards through meaningful engagement in the community. Initially, Caleb was in a group that noticed there was a lot food being thrown away at school. They decided to undertake the problem of food waste, and asked themselves “Is food being wasted at the school, and how can we reduce it?” But soon, the other group members abandoned the project, and Caleb was on his own to address the other questions and challenges the project would present. He would rise to the challenge, and as he discovered along the way, he was never alone because so many other people became invested in the project. Caleb was granted permission to measure how much food was being thrown away in the cafeteria. He addressed the students, informed them of his project, and asked for their participation, which they gladly offered. Unfortunately, many students were away on a field trip, so Caleb returned another day to obtain a more representative measurement. Caleb crunched the numbers, and moved forward in his research. He met with the school’s lunch program director to learn what they were already doing to reduce food waste, and what could be done. He investigated what was being done at neighboring schools to reduce food waste. He contacted local organizations that offer composting services. He considered the options, and moved forward. He met with the Superintendent and the District’s Finance Director to ask their partnership in reducing food waste. Now, the fate of Caleb’s project lies in others’ hands, but that hasn’t stopped him or the cafeteria from working to reduce waste in the meantime. Actions include changes in the menu to offer more desirable items to students, a share table where students can freely exchange items they are required to receive but don’t necessarily want to eat, and a food pantry that serves the community each month offers timely perishables to its clients. Caleb is still considering what more can be done. He plans to contact the administration to check on the progress of the motion, and to arrange to re-measure the cafeteria’s waste soon to compare with his initial findings. “But not during school break…because there won’t be very much waste,” Caleb says tongue in cheek. 4-H is a youth development program of the University of Maine Cooperative Extension, which celebrates 100 years in 2014. More information about 4-H in Maine, see http://umaine.edu/4h/. Freezing is a great, inexpensive way to preserve your fresh garden vegetables. But before you freeze your vegetables, a few steps need to be taken to improve the quality of your home frozen vegetables. First, wash and prepare your vegetables. See June 2014’s Maine Home and Garden News or Bulletin #4336, Best Ways to Wash Fruit & Vegetables for instructions on how to wash fresh vegetables. Next blanch your vegetables for the recommended amount of time (varies per vegetable) in boiling water. See Bulletin #4384, Freezing Vegetables for specific blanching times. Blanching helps to preserve your vegetables by killing enzymes that, over time, will affect the color, texture, and flavor of your frozen vegetables. Tomatoes, onions, and peppers do not need to be blanched before being frozen. See How To Freeze Tomatoes YouTube video for simple ways to freeze tomatoes. After blanching your vegetables, stop them from cooking by shocking them in an ice water bath. Fill a large bowl with ice water, and place your blanched vegetables in it for the same amount of time they were blanched. Drain your vegetables well, and dry them off in a salad spinner or with clean kitchen towels. Excess water can cause vegetables to clump together and cause a loss of quality. Pack dry vegetables into freezer-grade plastic containers, either in freezer-grade plastic ziptop bags or rigid-sided containers. Remove air as you seal the bag and leave 1/2-inch headspace in rigid containers. Using the right containers will help preserve the quality of your frozen vegetables. Label and date containers and place in a freezer set to 0 degrees Fahrenheit. Use vegetables with in 6 to 8 months for best quality. Add frozen vegetables to soups, stews, and sauces; or reheat by steaming or boiling. If you’d like to learn even more ways to preserve your garden’s yield, check out our schedule of hands-on food preservation classes. For more information, see Bulletin #4384, Freezing Vegetables.